Iceland has a special place on our travel bucket list, the top! This island country is my dream travel destination since I was a teenager and my first known Icelandic attraction was Björk. Guess what, I grew up and I discovered that Iceland is even more beautiful than I imagined, and my desire to explore this icy land became bigger and bigger. The reasons to visit Iceland are countless, the country was listed by CNN as one of the top destinations in 2016 due to its unique natural beauty and culture. There are many places to visit in Iceland and I’m not going to list them all, instead I’m gonna share with you 5 of my favorite Icelandic attractions. Places that will make you want to travel to this icy country right now. Think about going on a Northern lights vacation in Iceland and witness one of the most awe-inspiring landscapes in the world. The Aurora Borealis is one of the main reasons travelers from all around the world venture themselves in the dark and cold nights of Iceland. But the reward of facing the extreme temperatures and strong winds is the possibility to appreciate the magical dance of the northern lights. 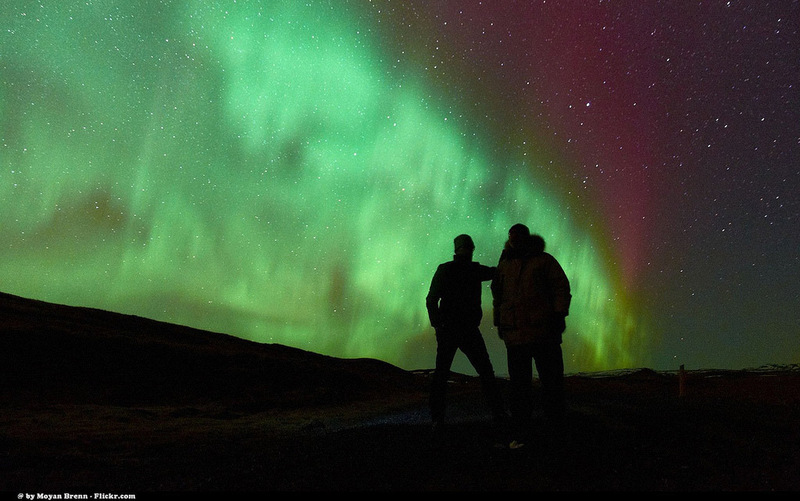 You can watch this natural spectacle on the outskirts of Reykjavík, but the far you go from the city, better the chances you have. If you go towards north more intense and extravagant the lights can get. Westfjords, Borgarnes are perfect places to see the northern lights, even better if it’s really cold or stormy outside. No doubt this is the most famous attraction in Iceland, and every time you see an Instagram photo of someone soaking in that blue and warm water you have the thought “I want, I need to go there”. I get it, I feel the same! The beautiful moonish landscape, the color of the water and steam make the Blue Lagoon a must visit attraction in Iceland and it can get pretty packed, but who cares?! 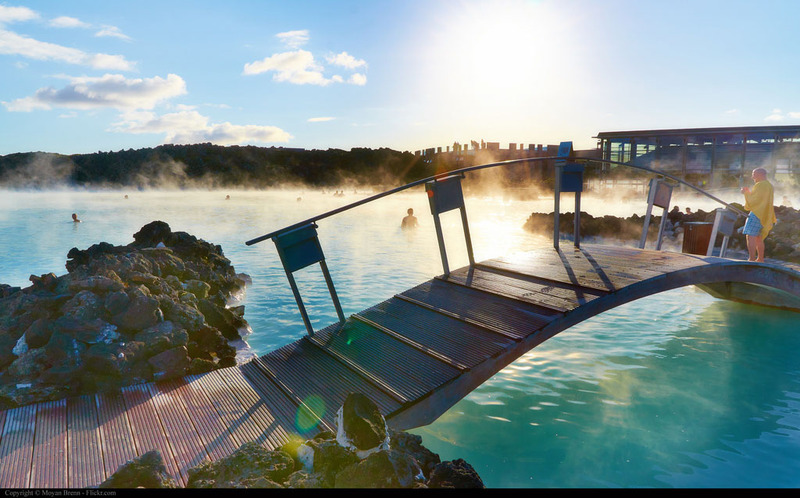 Take a dip and enjoy the geothermal spa, this is an experience of a lifetime! If you want to understand more about the volcanic activity and how the blue lagoon was formed, go on a tour and visit the lava fields that surround the lagoon. Crystal Ice everywhere! One of the most breathtaking places in the world. Skaftafell is located 4 hours away from Reykjavik and it is very important that you don’t tread into ice caves without a licensed tour guide. During winters when the rivers have become rock solid and glaciers have stopped melting it is the best time to go touring inside the ice caves. A trip to Iceland is not complete without a visit to this magnificent waterfall. During the Golden Circle tour you will pass by the Gullfoss Waterfall and don’t be surprised if you fall in love with this places, nature there is stunning. The water stream is fed by the Langjökull glacier, second largest glacier in Iceland, and the power of water is breathtaking. 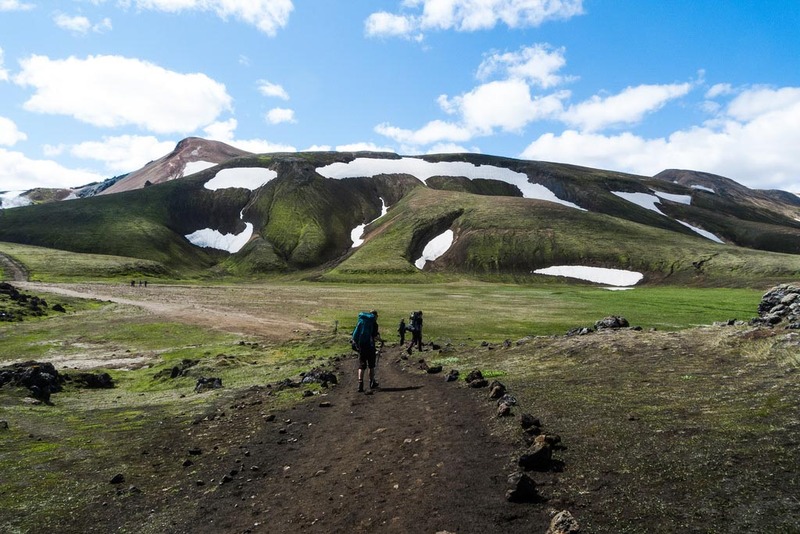 Located in the south-west part of Iceland, this 55 km extreme hiking trail is absolutely enthralling. With blizzard and strong winds trying to overcome the hikers at every step, the trail is challenging. The route starts from the hot springs area of Landmannalaugar to the glacial valley of Þórsmörk, along the way you will see the black sand deserts, mass of ice, beautiful pastures and much more. Have we convinced you to travel to Iceland? While writing this post my feet were itching and I even checked the flights to there. But for now, we are only in the travel planning stage. Be aware that Iceland is much more than these five attractions, this is just a tiny part of all the natural beauty you can find there. The high season in Iceland is during summer time [May to September], with mild temperatures and fully booked hotels. During the summer, the days are longer and it’s a beautiful moment to enjoy the nature and be outside. The thing is that some attraction as the Northern Lights and the icy caves are not there all year around, and unfortunately you will need to face the winter in Iceland to be able to see and enjoy them. Winter is the off-season, what means cheaper hotels, flights and tours. Plus the possibility to enjoy an extra dose of adrenaline while hunting the northern lights or venturing yourself in the middle of the ice. Iceland is a small country, to get around you can rent car and go explore it by yourself. Or you can book a tour and visit the waterfalls, geysers, volcanoes and glaciers. Bear in mind that in some National Parks and to visit the Skaftafell ice cave you will need an experienced guide. Going on a short trip to Iceland? So, maybe go on a tour will make more sense, as you can discover and cover more of the island in a short period.. 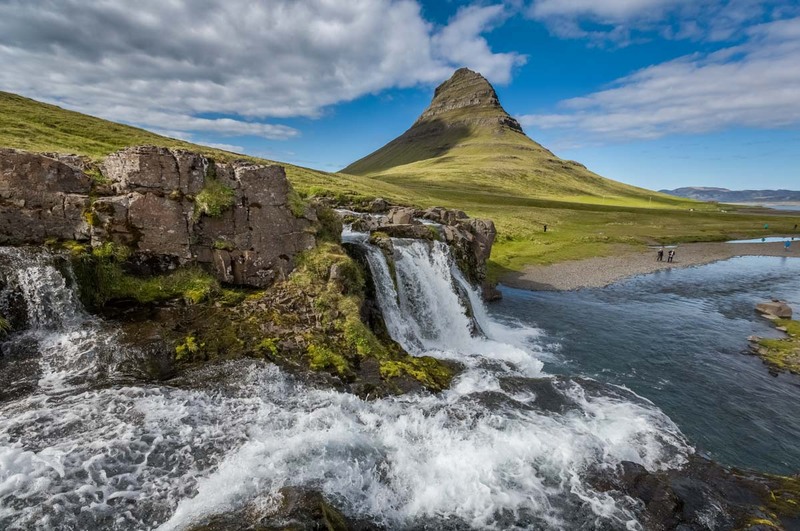 But if you are a truly explorer and have plenty of time, you can camping in Iceland, enjoy the outdoors life and the beauty that you only find there. To choose the best time to travel to Iceland and how long you should stay there, will all depend on each type of experience do you want to have. However, doesn’t matter if you travel during summer or winter time, for 3 days or a month, in Iceland you will always have fun. Are you planning a trip to Iceland? Leave your thoughts! Photos credit: Kirkjufellsfoss by iceland.is. The Northern Lights and The Blue Lagoon images copyrights by Moyan Brenn. The Laugavegur Trail by Alexander Hahn. We spent a fortnight in Iceland a few years ago and loved it. We went in summer, so we didn’t really see the Auroro Borealis, as the days are very long and bright making the nights very short – we saw a hint of colour the very last night. But after a couple of nights in Reykjavik we rented a car and drove around the main ring road. This was wonderful, the landscapes are so amazing. We did visit the blue lagoon but actually we preferred another outdoor lagoon-style bath up in Myvatn. I really want to visit iceland too! This is a great checklist! Iceland is our favorite country and we think you should definitely visit! But heading North has nothing to do with how vividly the Northern Lights appear. It has to do with how the sun and atmospheric gases react to each other and it doesn’t matter if you’re in Reykjavík or the Westfjords. The only difference between Reykjavík and the Westfjords is that there is far less light pollution from the city lights, so you can see the Northern Lights easier. Also, the weather is more stable in the North since it isn’t affected by the Atlantic currents like Reykjavík and the South Coast. Absolutely, the weather and all other conditions must be in line! It’s hard to choose the best time of the year to visit Iceland, all seasons have their beauty! What can I say? The more pictures I see of Iceland, the more keener I am to go. Just need to do lots more research, though. We usually take a long break in October and I need to know more about the weather at that time of the year. I have to agree that Iceland is one of the most beautiful places on earth and it has a special luring effect on travelers because of it. We were lucky enough to see and do all of the things on this list and I would highly recommend the trip to anyone. These are all great reasons to visit Iceland! The Blue Lagoon * The Northern Lights are right at the top of my list, but I’m afraid that living in Australia, it may be while before I get back to the far north of Europe to see them! I might have to settle for the Southern Lights in Tassie instead! Iceland is on my list for 2017 too! I have heard nothing but good things about the country. I would love to visit the National Park and the ice cave! Every time I read blogs about Iceland I discover a new place to visit. This time I learned about Skaftafell and Laugavegur. I’m going to Iceland in two weeks, hoping to see the Northern Lights, but even if I don’t, it will be an amazing trip. Enjoyed your post. Now I’m off to research Skaftafell! OMG! Enjoy Iceland!! We saw the Northern Lights this year in Finland, it was amazing! I’m sure you gonna have an amazing time!